I grew up in a New York City apartment building with many Jamaican neighbors. The fragrant spices and vibrant flavors of the Jamaican kitchen have been part of my culinary lexicon since childhood. The scent of simmering curried goat regularly wafted in the hallway as the tunes of Bob Marley and Peter Tosh blared from the stereo. When I eventually ventured to the island as an adult, I felt a gustatory homecoming of sorts. The fusion of flavors was familiar, but when I finally sampled it in its genuine location using freshly harvested, homegrown ingredients, my taste buds were elevated to another level. 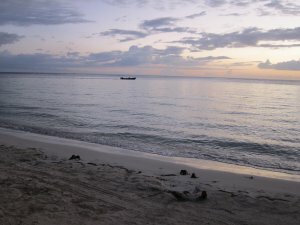 Jamaica has its share of high-end restaurants and even its own celebrity chefs, but at its essence it is casual food, best sampled at roadside cook shops and beachfront jerk shacks with a non-pretentious presentation. My favorite way to enjoy a meal here is with sand between my toes and an icy Red Stripe in hand. I like to do this at Little Ochie, located on an unspoiled section of the south coast, not too far from Manchester in Alligator Pond, but far enough to feel off-the-beaten-track. 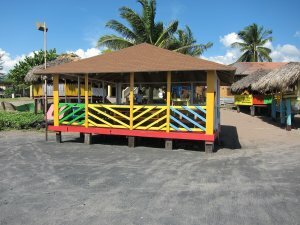 This fish shack is where locals come to eat. The omnipresent proprietor, Blackie, oversees a fleet of rather rickety wooden boats that continuously depart the shore seeking the freshest catch, so what you eat has probably been caught within the hour. Blackie runs the place with the help of his extended family, and pretty much everyone, from the jerk pit master to the dishwasher, is a cousin, uncle or in-law. Convivial Blackie has the knack of making everyone feel part of the furniture, no matter how novel the experience is for you. Fresh-speared lobster, steamed snapper, pepper shrimp and jerk fish are house specialties, caught steps from this ultra-casual beachside eatery. Everything is cooked to order and accompanied with festival, the rich, fried rolls that are laced with a touch of cornmeal. Between courses you will sip fish tea, a light seafood broth that cleanses the palate in a delicious way. 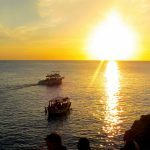 On weekends there is live reggae music, and in summer Blackie hosts a popular Reggae festival. 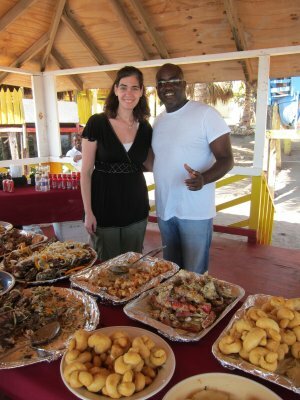 Can you eat authentic Jamaican food at an all-inclusive resort? As welcoming as the vibe is at Blackie’s, not everyone is going to feel comfortable renting a car and driving Jamaica’s pot hole-strewn roads searching for locavore delicacies. It is no secret that crime and poverty exist here. 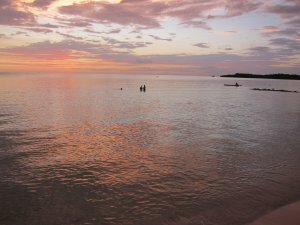 This combination leads many visitors to stick to the tried-and-true path of staying put at their beachside resort, where they can enjoy the beauty of this country without hassle. 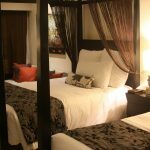 Jamaica pioneered the all-inclusive hotel concept, so it is quite likely that you may choose one of these resorts for your Jamaican vacation. 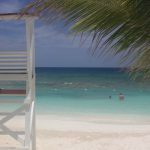 I have stayed at several of them throughout the Caribbean, and there certainly are benefits to a pay-one-price holiday. But as a foodie, these places left me hungry. Sure, the quantity was there, but the quality and connection to the place was always missing. 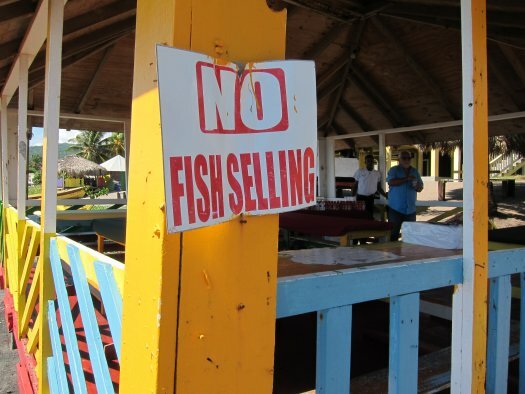 I was finally able to marry the ease of the all-inclusive getaway with my foodie proclivities at Sandals Whitehouse. To be frank, my expectations were low, colored by my past experiences of bland buffets and low-end cocktails that these resorts usually serve. 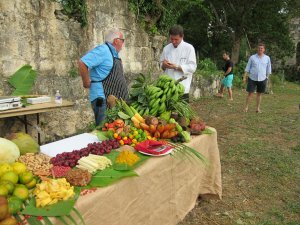 So I was pleasantly surprised to have the opportunity to experience the traditional taste of the island at Sandals Whitehouse. True to the all-inclusive concept, meals and drinks are included in the price of your vacation. There are a few factors that I think account for the authentic culinary adventure that I experienced. 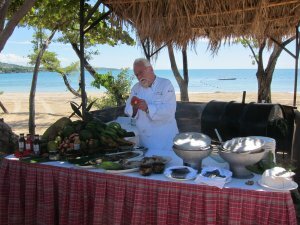 The first is the partnership that Sandals has with chef and culinary historian Walter Staib. 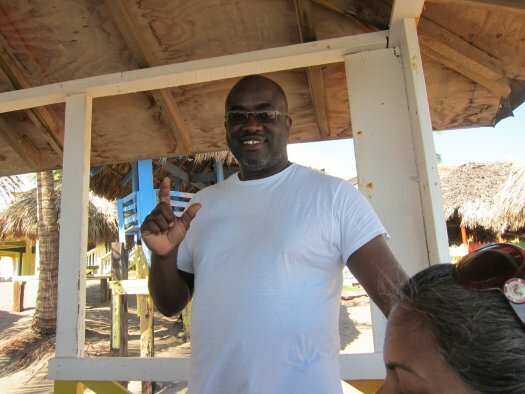 He is an expert on Jamaican cuisine, and local dishes infuse the menu. While you can dine at a variety of international restaurants at the resort, Jamaican cuisine is the star of the show. Staib insists that locally grown ingredients such as ginger, allspice (called pimento in Jamaica) jackfruit and tamarind are featured. 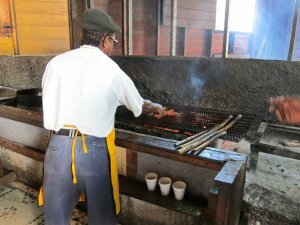 He is a stickler for detail and his method for jerk, Jamaican barbecue, is traditional, cooking the meat or fish over wood from the Allspice tree. Don’t miss sampling Jamaica’s national dish, ackee and salt fish. The mild ackee fruit has the texture of scrambled eggs and the infusion of bits of briny salt fish compliments it perfectly. The Scotch bonnet pepper enhanced soup West Indies Pepperpot is available for your degustation, but dare to taste it only if you go for fiery flavors. The wealth of locally grown produce is a menu highlight and expect to sample breadfruit, mangoes, coconut and many more luscious tropical fruits. The leafy local green, callaloo, is prepared in a variety of tasty ways. The other factor that will enhance your culinary experience is the rum that is served here. El Dorado rum recently became the rum of choice at Sandals. You will be drinking pouring rum in your tropical mixed drink. These young rums are tasty when mixed with fresh juices, and are just the thing to quench your thirst while you bask in the glorious sunshine watching the turquoise sea. But it’s the sipping rums, long-aged in whiskey and bourbon casks that stand out. Sipping rums have a cult-like following in much of the world, and spirit enthusiasts savor them as they would a fine single malt whiskey. These fine aged rums are available at no extra cost, so this is the perfect place to develop your rum connoisseurship as you sample the golden amber-toned Special Reserve 15 Year Old that has garnered awards and accolades. 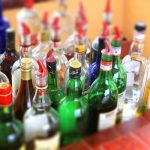 The sipping rums pair well with a variety of Jamaican food, so be ready to participate in several rum-soaked dinners before you leave. If you have a sweet-tooth, save room for dessert, as these aged rums to go particularly well with Jamaican puddings. You can taste the British influence as you sample sticky treacle and gooey sauces. They are often blended with island fruits, creating a spectacular melange of flavors, a lovely way to end your meal. Wherever you choose to stay in Jamaica, don’t miss out on sampling its largely unsung cuisine.